Enrico Lorenzo Macam Pineda better known as Enzo Pineda (born on August 12, 1990 in Quezon City, Metro Manila). He is a Makati-based aspiring actor who dreams of becoming a superhero. He is a finalist in the fifth season of StarStruck V. He can act, dance and give a hard kick with his Taekwondo skills. He studied highschool in La Salle Greenhills. He is now a second year college student in University of Asia and the Pacific, Entrepreneurial Management. He stop his studies when he entered the talent search StarStruck V.
Pineda is a varsity player in his School, he used to play Soccer,Football,Archery,Taekwondo. He really loves sports. His passion is dancing, he is a member in a dance group called Squadra. Squadra is the most popular Dance Group in University of Asia and the Pacific(UA&P) exclusively for UA&P student(s) only. In his past time, he do play Playstation,Gym. Pineda came from a good family. His father Eric Pineda is Manny Pacquiao's Business Manager. Rumors says Pineda use his father's influence to enter the Talent Search StarStruck V but he told PEP that he did not use his father's influence to enter the show. Pineda auditioned for the fifth season of Starstruck in 2009 won November 29, he was announced as one of the season's 14 finalists along with Rocco Nacino, Sef Cadayona, Ian Batherson, Rye Burgos, Steven Silva, Piero Vergara, Diva Montelaba, Sarah Lahbati, Zeryl Lim, Rox Montealegre, Fianca Cruz, Nina Kodaka, and Princess Snell. As of January 2, 2010, he is still in the competition. Some boys describing Enzo as their "biggest threat" in the competition. He once ask about who will he want to be paired/loveteam, and he answered it was Sarah Lahbati, his co-survivor. He and Lahbati once arguing,but soon cleared up. Now, they are both good friends. He won as the StarStruck V First Prince. He is a Makati-based aspiring actor who dreams of becoming a superhero. He can act, dance--and give a hard kick with his Taekwondo skills! 1. He likes watching MTV, UFC, boxing--and America's Best Dance Crew. 2. Brad Pitt and Dingdong Dantes are good role models for Enzo. 3. He likes listening to "Run This Down" by Jay-Z and Rihanna. 4. On his free time, he does martial arts, work out and play video games! 5. He likes Japanese food. 6. He has 3 hotdog dogs (like Slinky from Toy Story) and a Jack Russel terrier. 7. English is his favorite subject, but he thinks he's only an average learner. Why did you enter showbiz? "I entered showbiz because I love to perform and share my God-given talents. If I can dance and act in my sleep I would do so. :P"
If given the choice, which Kapuso star would you want to act with? "Jomari [Yllana] because he is a very good actor." What was the toughest challenge you had to face? "Trying to sing with a mic hehe (my voice feels different when using a mic)." What is your biggest frustration? Your biggest regret? "When I fell off the swing and chipped my front tooth when I was little. Embarassing, haha." "My family and being close with God." "My limitation is in singing. I need more practice /o/"
What is your most unforgettable experience? "When I found God in my life and realized that if you trust in Him everything will fall in its right place "
"Losing God in my life and concentrating more on myself rather than glorifying God." "To be a versatile actor and a "super hero". Hehe!" Given the grim nature of competitions this present time, is it still possible to have a fanbase which would cling to decent actions? If your answer is no, you probably havent heard of the Enzopporters. The Enzopporters is a fresh group of people who simply aimed to support Enzo Pineda on his journey on Starstruck V. On the 29th of November 2009, a thread dedicated to him on PinoyExchange.com(PEx) brought to light the Enzopporters, a shortened term for Enzo and Supporters. The other choices for the group name were Enzolites (Enzo+Elite for Starstruck V Elite Explosion) and Enzophinoes (Enzo+fans or phinoes). 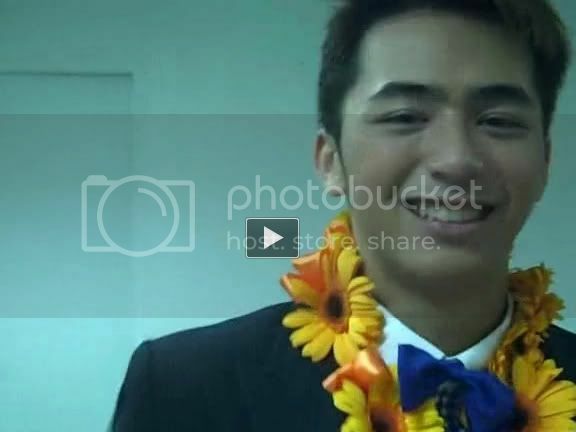 Enzopporters became the official fanbase title when Enzo Pineda himself thanked and recognized the name on a shoutout episode in December 10, 2009. Enzopporters started out with members from the online forum PEx, but was extended to the real world after their first meet-up in the first elimination night of Starstruck V. Now, the Enzopporters is composed of more than 60 people from online forums, people who come and cheer for Enzo and Enzsarah every live elimination nights and mall shows and hundreds of people who vote for him on Starstruck V through text and online voting. The Enzopporters is comprised of people from all walks of life, from different places across the country, may that be in Luzon, Visayas or Mindanao or even outside the country, people from different age brackets and backgrounds. Of course the numero uno fans of Enzo would be his family and friends. 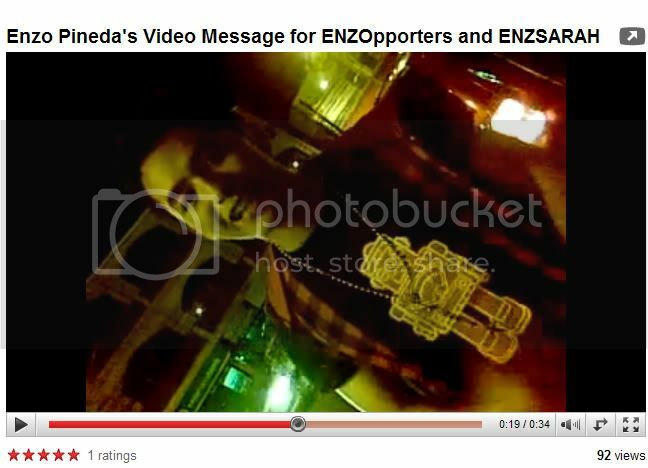 Even the high-profiled Mr. Eric Pineda created a PEx account, in the name of enzodad, in response to the request of Enzopporters. Enzo also has an account on PEx that he still uses, despite the barrier of "isolation" in virtue of the Quarter 1110. What makes Enzopporters unique and unified are the values that they keep upholding, which are summarized as E-N-Z-O-P-P-O-R-T-E-R-S: Esteemed, Noble, Zealous, Open-Minded, Polite, Persevere, Optimistic, Reputable, Tactful, Encouraged, Remarkable, Smart. It is no less than Enzo Pineda who inspired the Enzopporters to make a difference by being the light among the dark as per Enzos favourite song, Liwanag sa Dilim. A visit on his thread might end the misgivings. While others resort to trash-talking against other contenders, the Enzopporters keep itself firm on the principle spearheaded by Enzo. Amidst the derogatory comments others have posted upon Enzo, the course of action only boils down to two: defending Enzo or ignoring them at all. Now on its (third thread) on PinoyExchange, the Enzopporters has been stronger than ever and after a meeting headed by Mr. Eric Pineda, the father of Enzo, Enzopporters became more of a force to reckon with on the competition, paving the way for the alternate name, the Enzoforce. We dont know how things in the competition will turn out but one thing is for sure: Enzopporters will always stay by Enzos side and will manifest the inspiration that we have been getting from Enzo since day one of his Starstruck Journey. It is not actually the competitiveness of Enzo that was admired by many but his positive spirit, motivation and humility in the world of mayhem called showbusiness. This inspired the Enzopporters to also do their best in everything, always keep positive and succeed without stepping on others. --repost this in every page. and feel free to add yourself. Enzo Pineda of Starstruck V.
StarStruck Survivor 6 on SOP "Crushy Crushy"
Want to know the latest scoops about Enzo? Wanna get close to him? SUNSCRIBE now to his FANATEXT! Enzo will be sending you his latest updates about him straight to your mobile phone! Just text [highlight]ENZO ON[/highlight] and send it to [highlight]4627[/highlight]. Open to all networks. For daily MMS, key in [highlight]GOMMS ENZO ON[/highlight] and send it to [highlight]4627[/highlight]. "I want to create my own identity. Kasi pangarap ko po talaga ito at ayoko pong gumamit ng any way para makapasok. Gusto ko po sariling sikap po. Gusto ko ring makita kung bibilib din ang mga tao sa akin," says Enzo Pineda, son of the business manager of Manny Pacquiao, Eric Pineda. Nilinaw ni StarStruck V finalist Enzo Pineda na hindi siya gumamit ng koneksiyon para makapasa sa auditions at makapasok sa reality-based artista search ng GMA-7. Bilang anak kasi ni Eric Pineda, business manager ng Pambansang Kamao na si Manny Pacquiao, ay posibleng gawing issue ito kontra sa kanya. Pero sinabi niya na dumaan siya sa proseso at hirap, katulad ng pinagdaanan ng iba pang finalists. "Pumila po talaga ako during the last audition day. Pero siguro dahil last day na nga kaya konti na lang po yung nag-o-audition. Pumila po ako ng 11 ng umaga, then mga 11:30 po nasa loob na ako. Gabi na rin po nung matapos kami," paliwanag ng 19-year old na si Enzo nang ma-interview siya ng PEP (Philippine Entertainment Portal) during the press launch and presentation ng StarStruck V Final 14 last November 30 sa Studio 5 ng GMA Network. Suportado naman daw ng daddy niya at ng buong family niya ang pagpasok niya sa StarStruck. Sa tingin niya ba, may advantage siya na tatay niya si Eric Pineda at close siya kay Pacquiao ngayong finalist na siya sa StarStruck? "For me po, hindi, kasi I also want to create my own identity. Kasi pangarap ko po talaga ito at ayoko pong gumamit ng any way para makapasok. Gusto ko po sariling sikap po. Gusto ko ring makita kung bibilib din ang mga tao sa akin," sabi ni Enzo. KUYA MANNY. Ayon kay Enzo, 16 years old daw siya nang una niyang makilala si Pacquiao. Nakasama na rin daw niya ito sa ilang parties at events. Kumusta naman ang pakikipag-meet niya kay Manny? "Siyempre, matagal ko na ring nakikita si Kuya Manny. Sobrang bait po niya. Para po siyang part ng barkada dahil marunong po siyang makitungo sa mga tao." Biniro naman ng PEP si Enzo kung personally ay nabigyan na ba siya ng balato ni Manny? "Ay, hindi pa po," nahihiyang sagot ni Enzo. "Pero ang pakikipagkaibigan po ni Kuya Manny sa akin sobrang okay na po yun." Hihingi ba siya ng tulong kay Manny para dumami ang boto niya? "Sana po tulungan po ako ni Kuya Manny at ni Ate Jinkee, sila po mismo ang magbo-vote sa akin. Pero para sa akin po, hindi po ako hihingi ng tulong. Baka kasi sabihin ng mga tao ay ginagamit ko lang si Kuya Manny. Ayoko pong mangyari yun. Pero sobrang nakaka-touch po kung kusa po nila akong tutulungan," ani Enzo. TOUGHEST COMPETITOR. Umasa ba siyang makakasama siya sa Final 14? "For me, of course, mahirap sabihin na ine-expect, pero gusto ko po talaga. I'm here, I feel so blessed na nakarating ako rito sa Top 14. Hindi ko talaga ine-expect, pero siguro dahil sa hardwork ko at talent ko na rin also." Itinuturing niyang toughest competitor among the boys ng StarStruck V si Sef Cadayona. "Si Sef po ang mahigpit kong kalaban dito, kahit best friend ko po siya dito... pero dahil magaling siyang sumayaw at saka umarte. Marami na rin po siyang experience, lalo na sa commercials." Ano sa tingin niya yung puwede niyang ilaban kay Sef? "Siguro po ang advantage ko is I have so much to learn. Marami pa po akong hindi na-experience. Marami pa akong kailangang i-practice. I hunger for learning, kumbaga. I also excel in dancing like Sef. Pero me and Sef have our own different styles. That makes us different." Kanino niya gustong makipag-loveteam sa mga ka-batch niyang babae? "Lahat po sila magaganda. Pero given a chance, ang gusto ko po ay si Sarah [Lahbati] at Fianca [Cruz]," sagot ni Enzo. Sa mga artista ngayon sa showbiz, gusto namang makatrabaho ni Enzo si Rhian Ramos. "Si Rhian dahil kasing age ko po siya. Matangkad din siya. At saka crush ko po siya. Sana po makilala ko siya." Isa sa ibinabatong intriga sa StarStruck V finalist na si Enzo Pineda ay ang yaman ng pamilya niya, na siya diumanong dahilan kaya hindi pa siya natatanggal sa competition. Si Enzo ay anak ng business manager ni Manny Pacquiao na si Eric Pineda. Hindi naman kaila na kaakibat ng bawat boxing match at endorsement ni Pacman ay may bahagi rito ang ama ni Enzo bilang business manager ng Pambansang Kamao. Ang tungkol dito ang isa sa mga itinanong ng PEP (Philippine Entertainment Portal) kay Enzo sa pocket presscon na ipinatawag ng GMA-7 para sa natitirang walong contenders ng StarStruck V kahapon, January 20, sa 17th floor ng GMA Network Center. Bukod kay Enzo, nasa competition pa rin sina Ian Batherson, Rocco Nacino, Steven Silva, Nina Kodaka, Sarah Lahbati, Rox Montealegre at Diva Montelaba. Ano ang tunay na nararamdaman ni Enzo kapag naririnig niya ang intriga na dahil lang sa impluwensiya at yaman ng kanyang pamilya kaya siya tumatagal sa StarStruck V? "For me, it's their opinion," sagot ng 19-year-old showbiz hopeful. "Siguro sa umpisa po, parang, 'Bakit ganun?' Pero, I just have to reflect on things dahil alam ko di naman ganun ang pamilya ko. We're good Christians. But I can't deny na tinutulungan po ako ng buong pamilya ko. Maybe through networking lang or through friends, which I really appreciate. Kasi lahat po kami [sa StarStruck V], tinutulungan talaga ng pamilya namin. We can't help it also." Pero siya raw kasi ang pinakamayaman sa mga contestant, at dahil 50 percent ng votes ay mula sa text votes, malaking advantage ang pagiging mayaman niya. "Hindi naman po based sa money, e. Nandito po ako hindi po dahil sa parents ko. Kumbaga, I want to create my own identity. I'm here because I love to perform. Sumali po ako ng StarStruck like everybody else. Pumila po ako. Lahat ng challenges po pinagdaanan ko po kagaya ng lahat po sa amin.... So, pantay-pantay po kami," pagtatanggol ni Enzo sa kanyang sarili. IAN & ROCCO. Among the StarStruck V contenders, sina Ian at Rocco ang masasabing pinaka-outspoken sa opinyon nila na maaaring gamitin ni Enzo ang pagiging mayaman niya para magtagal sa competition. Ano ang masasabi ni Enzo rito? "For me, I respect their opinion. I don't take it against them dahil sila po yun, e. Kanya-kanya pong... Lahat po ng tao may sariling opinion. You just have to reflect on things. Pero kilala mo naman ang sarili mo, kilala mo ang pamilya mo. And hindi po ako affected dun dahil alam ko yung pamilya ko," sagot niya. Pero hindi ba siya kinausap o hindi ba niya nilapitan sina Ian at Rocco tungkol dito? "Hindi ko po sila nakakausap about it. Even though we're good friends, alam po nila na..."
May sama ba siya ng loob kina Ian at Rocco? "Wala po akong sama ng loob sa kanila," paglilinaw ni Enzo. "Pero for me, it's another challenge in life. May mga dating artista, let's say na anak ng presidente, ganun din po yung pinagdaanan niya. And now she's very successful. So it's just another challenge in life, so you always have to be positive lang. You don't have to take it against them dahil it's their opinion. So, kumbaga, gawin mo na lang sa mga performances mo, parang to show that you are worthy in being an artista." Hindi ba siya mas lalong nahihirapan dahil alam na niya kung sino ang kumakalaban sa kanya? "Actually, lahat po ng guys, competitive. During challenges, nakikita ko po they're really trying their best as well. Lahat po kami. Pero at the end of the day, kahit anong mangyari, magkaibigan pa rin po kami. "So, para sa akin, hindi naman siya pressure dahil gusto ko po yung ginagawa ko. I know na may mas magaling sa akin, sa singing or acting. Pero I'm concentrating on myself because I want to improve. I don't compare myself to others because we are all different. Parang I don't have to be somebody else because being yourself makes you different already. I just have to be focused on my purpose and goal." Sino ba ang pinaka-close niya sa StarStruck? "Closest po? Actually, lahat po kami nagkaroon na ng moments namin. So, parang moments in terms sa nakapag-usap ng personally, we know each other. So, lahat po kami close." Pero sino yung pinakamalapit talaga sa kanya? "Siguro si Ian at Rocco," sagot ni Enzo. "Kahit, let's say kay Rocco, competitors kami, lumalabas kami, we still go out, eat. Lahat kami, parang magbarkada kami sa StarStruck." Galing na rin mismo kay Enzo na lumalabas sila nina Ian at Rocco, pero bakit hindi nila napapag-usapan yung saloobin nila sa isa't isa? Matagal bago nakasagot si Enzo. Nang makapagsalita na siya, ito ang naging pahayag niya: "Hindi na lang po namin pinag-uusapan dahil parang we respect each other's opinion and magkaibigan kami. So, hindi naman po magkakaroon ng gulo dahil personally, I respect their opinion kahit po yung mga sinasabi. "It's a competition po. Kailangan maging competitive ka talaga. Ipakita mo. So I don't really take it against them. Kahit sinasabi nilang ganun, 'mayaman', for me, it's just a challenge. Yun. Parang it's not a big deal because alam ko naman yung totoo, e. Yung pamilya ko ipinanganak as good Christians, hindi po namin gagawin 'yan. Kung pag-usapan man or not, hindi po masakit sa loob ko yun dahil alam ko na we're good persons." ENZO IS IMPROVING. Hindi ba napapagod si Enzo sa araw-araw nilang schedule sa StarStruck V? "Para sa akin, hindi po. Mahirap maging artista, pero ano siya, worth it talaga. Dahil sa mga fans, naniniwala sa 'yo. And, of course, you really have to love what you're doing. For me, nandito ako dahil passion ko talaga. I love to perform. Even though I know some of my talents are raw pa, there's always room for improvement. Pero it's an ongoing process talaga. So, masaya ako," sabi niya. These past few weeks ng competition ay napapansin ng StarStruck Council members na sina Lolit Solis, Iza Calzado, at Floy Quintos ang improvement ni Enzo sa challenges. Ayon nga kay Direk Floy, nagiging threat na siya sa ibang survivors, partikular na kay Rocco na siyang madalas makakuha ng award. "Happy ako na nakikita nila yung improvement ko because I've been really working hard to improve," sabi niya. "Hindi lang po si Rocco ang benchmark ko, but also yung other artists like Dingdong Dantes. For me personally, kahit after StarStruck, hindi pa tapos yung pangarap ko. I want to be one of the great artists someday na all-around performer. So, kahit after StarStruck, parang there is always room for improvement." When you say na si Rocco yung benchmark mo, does it mean na si Rocco rin ang toughest competitor mo? "Yes. Siya yung toughest competitor ko. So, I have to be better and always improving," sagot niya. What about Ian and Steven? "For me, they're also improving talaga." Do you also see them as tough competitors? "They are tough competitors. Pero si Rocco po yung nanalo ng award, medyo it shows na he is the one working harder." Two weeks ago ay nalagay na rin sa bingit ng elimination si Enzo nang silang dalawa ni Piero Vergara ang naiwan. Pero sa huli ay nakaligtas si Enzo at si Piero ang natanggal. Ano ang naramdaman ni Enzo noong pagkakataong 'yon? "Of course, sobrang kinabahan ako," sambit niya. "Expected ko po talagang mapupunta ako sa bottom two. Because from what I read sa mga thread sa Internet, na ako po yung gusto nila i-out. For some reason na rich kid daw ako. I know na hindi naman mawawala yung issue na ganun, but I just have to... It's their opinion... It's negative on their part na ganun. Pero for me, wala po sa pagkatao ko na magalit or ano. I just take things on a positive side. Dahil wala naman pong mangyayari if magalit ka or ano... Kailangan pinapakita mo sa tao na worthy ka into being an artista or in StarStruck." So far, ano yung pinakamahirap na challenge na na-encounter niya sa StarStruck V? "For me, singing talaga," sagot niya. Bakit siya ang deserving maging Ultimate Male Survivor? "First, I'm really sobrang working hard to improve myself. Not just to win. Para sa akin po, ang manalo is bonus na lang po sa lahat ng efforts ko. But, of course, sino pong hindi gustong manalo? After, if manalo ako, sobrang blessed ako at the same time, I get more chances into show business to show yung iba ko pang talents. Like someday, I wanna be a singer slash dancer. Pero for now, I really have to concentrate on my singing. Kasi beginner pa lang po ako sa singing," sabi ni Enzo. for more articles and write ups about Enzo, click HERE! E-nrico Lorenzo Macam Pineda ang buong pangalan ng Idol ko. O-n his free time, he does martial arts, play video games and work out. Para lagi nating makita ang kanyang kagalingan. This are the 3 words that best describe him. Kaya sa mga Mall Shows mo, kami'y dadalo. Lalo na ako na laging nandyan. ENZO PINEDA - isigaw natin nang buong buo! Mahal ka namin!!! Ang aming suporta ay iyong iyo. Here's a fan poem made by ENZOpporter Karlo. for him, Enzo is not just a StarStruck Contender, but he also believe that Enzo is simply an inspiration among his fellow youth, teaching them to keep their faith to God and to remain strong at any moment. through this poem we, ENZOpporters made up our minds to keep believing what a real Enzo Pineda is. so, here's the poem entitled.. ENZOmniac Fever. And so as to Wilson, he made an acronym inspired by the name of the fanbase ENZOpporters, that shows the qualities of a real ENZOpporters and also these qualities are also seen to our only one idol ENZO PINEDA. We are the Enzopporters. And we're proud of it. Another ENZOpporter named Mark shared his deepest thoughts about Enzo Pineda. For him, ENZOpporters is his very first fandom and Enzo Pineda is his very first Local Celebrity Idol. He shared his words through a literary work, defining Enzo as his inspiration. And later on, will be the nation's next big thing! Enzo Pineda, the best among the rest! Together with his skills developed rightfully. And his talents that are highly impressing. And he'll go on with his journey that no one can stop. And make his career grow as life replenish his plans. My trust will always be with him, a feeling that no one can abort. click the image below for you to watch it. 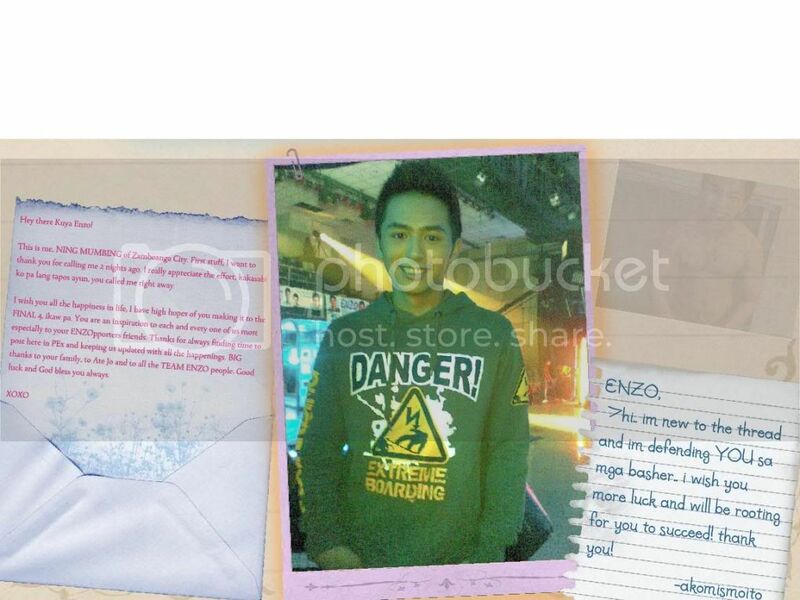 Here's a fan account of Enzo Pineda's Starstruck Journey, as well as the journey of being a self confessed ENZOpporter written by Jhayr Jabon, the starter of Enzo's thread here on Pinoyexchange. This article, dubbed as Jhayr's privilege speech during the Online Victory Party of the Enzopporters, was made days after the Starstruck Final Judgment. November 15,2009 kasagsagan ng laban ni Manny Pacquiao at Miguel Cotto. 12NN nung biglang icommercial sa GMA-7 ang pilot episode ng StarStruck V. Eto daw ang biggest season ng StarStruck. Then kinagabihan ayun napanuod ko ang Pilot Episode. Pinakita ang libo libong nag audition. Libo libong nangarap na galing sa iba't ibang sulok ng mundo na magkakalapit lapit ng dahil lamang sa programang ito. Sa Pilot Episode napili ang Top 100 hopefuls. Dito ay una kong napansin ang isang Japinay Beauty na sumayaw ng Nobody sa Japan. At sya ay si Nina Kodaka. Sinabi ko na hindi ko bibitawan ang babaeng to hanggang Final 4. At maya maya ipinakita ang mga lalaking pasok sa Top 100. May isang contender na nakakuha ng atensyon ko. Siya yung laging nakangiti, siya yung cheerful, sya yung may positive outlook sa talent search na ito at sya yung makikita at mararamdaman mo yung determinasyon sa una pa lang, at ito ay si Enrico Lorenzo Pineda. ENZO kung tawagin. Sa sumunod na episode na napanuod ko ay napili ang Top 30 at nakapasok nga sina Enzo Pineda at Nina Kodaka. Masayang masaya ako na napili sila sa tatlumpung masuswerteng nag auditon para sa StarStruck. Kinabukasan ay nabawasan sila ng dalawa at naging 28 na lamang. Sa unang episode ng StarStruck Shout Out, dito lagi ko ng napapansin si Enzo. Talagang may ibubuga. Hindi sya nagpapahuli. Natatawa lang ako sa isang episode kung saan may make up session sila. Siya yung contender na palatanong. Hindi ko alam kung nagpapansin ba sya, nangungulit o talagang curious lang sa gagawin nya. Dito mas lalo akong nagkainteres sa taong to. Natatawa ako pag nakikita ko sya dahil dun sa pagtatanong nya kay Ms. Barbie. Naalala ko isang beses napapagpalit ko pa ang mukha nila ng isa sa kanyang co-survivor na kapareha nyang may ENRICO sa pangalan. At sya ay si Rocco Nacino. Sa sumunod na episode ng StarStruck, ang gabi bago iannounce ang Final 14, isa isang humarap ang Top 28 sa council. Dito ko mas lalong nakilala si Enzo Pineda. Laking gulat ko ng malaman ko na sya ay anak ng Manager ng Pambansang Kamao na si Manny Pacquiao. Bakas sa mukha nya na gusto nya na gumawa ng sariling pangalan sa industriya ng Show Business, kahit na hindi naging madali sa kanya ang pagpila at paghihintay para matawag ang kanyang pangalan kung sya ba ay pasok o hindi. At kinabukasan, ang araw na pinakahihintay ng lahat, ang Final 14 Announcement. Isang mahalagang anunsyo na babago sa takbo ng buhay ng nalalabing dalawampu't walong nangangarap na maging artista. May apat ng naunang bahagi ng Final 14. Kampante ako na makakapasok ang dalawa kong paboritong survivors na sina Nina at Enzo. At sa pagkakataong ito, sa 2nd batch ng mga kasama sa Final 14. natawag ang pangalan nina Enzo Pineda at Nina Kodaka. Ang bagay na nagpasaya sa akin at ang dahilan ng pagsuporta ko sa programang StarStruck V.
Matapos ang naturang programa ay dali dali akong nag log-on sa PinoyExchange.com, isang website para sa pakikipagpalitan ng opinyon at pala-palagay ng mga Pilipino, gamit ang aking account. Dito ay gumawa ako ng thread para kay Enzo Pineda. Nung una ay nag aalinlangan pa ako na simulan ang pagtatayo ng fanbase para kay Enzo at thread para sa kanya. Naisip ko na baka walang sumuporta sa akin sa paggawa ko ng thread na ito. Naisip ko na baka walang nakakakilala sa kanya. At naisip ko rin na baka mapag iwanan lang ang thread na ito kung sakaling gagawa ako dahil sa aking busy academic schedule. At eto na nga, buong tapang kong pinagmalaki ang survivor na may pinakaunang thread sa PEx at yun ay si Enzo Pineda. Kinabukasan, marami ng nagpost sa thread. Mga sumusuporta kay Enzo. Mga fans nya. At dito ay naisipan ni Sed ang pangalan ng grupong lubos na sumusuporta kay Enzo Pineda at ito ay tinawag na ENZOpporters. Sabi nung iba parang hindi daw magandang pakinggan. Sabi ko naman sa sarili ko, nasa tao yan kung paano magsisink in sa kanya yung pangalan ng fanbase. Talagang ipinagmamalaki ko sya sa mga kaibigan ko, sa mga kamag-anak at magulang ko. Sabi ko na wala syang ibang katulad. Walang wala! Nasa kanya na ang lahat ng bagay na hinahanap ng isang babae para sa kanyang PERFECT MATCH. At nasa kanya na ang MATINEE IDOL FIGURE na hinahanap ng isang lalaki. Nang makita ko sa facebook ang kanyang real account, dali dali ko syang in-add. At ilang araw lang ay inaccept na nya ako. Dito ay naisipan ko rin na gumawa ng fanpage para sa kanya. Nagulat ako dahil ilang minuto lang ang nakalipas, mayroon na agad syang 66 fans. At hanggang sa dumami na ito hanggang sa kasalukuyang bilang nito na umabot sa 8000+ na dadami pa sa mga susunod na araw. Ilang araw lang ay naaabutan kong online sa facebook chat si Enzo. Dito ay kinausap ko sya. Nagkamustahan at hanggang sa ipinakilala ko sa kanya ang akong sinimulang fanbase, ang ENZOpporters. Dito inaya ko sya dumalaw minsa sa kanyang thread dahil sa marami syang fans dito. At hindi nga ito nagdalawang isip na gawin ito dahil makalipas ang isang linggo ay may account na agad sya sa PEx. At ang nakakatuwa pa sa aking pagiging isang ENZOpporter ay nagpost sya sa wall ko sa facebook ng "HAOOY BIRTHDAY" nung birthday ko. Nagkamali man sa pagtype ay sobrang napasaya ako ni Enzo dahil alam nyang birthday ko at binati nya pa ako. Kinabukasan, sa isang episode ng StarStruck Shout Out, nabanggit nya ang ENZOpporters. Akala ko nagkamali lang ako ng dinig yun pala ay binanggit nya talaga ang fanbase nya. 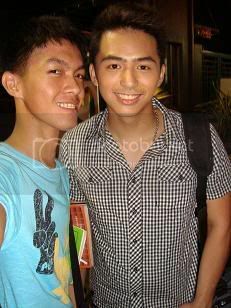 dECEMBER 10,2009 ng aking inanunsyo sa thread ang pagiging OFFICIAL ng ENZOpporters BILANG FANBASE NI ENZO PINEDA. Sa pagdaan ng mga araw, naging bahagi ng buhay ko ang araw araw na panunuod ng StarStruck Shout Out. Nag iisang bagay na hinding hindi ko malilimutan ay ang pagka-cutiing classes ko makapanuod lang ng StarStruck Shout Out at makita lang sio Enzo Pineda. Hanggang sa dumami ang ENZOpporters, mapa-facebook man, mapa-PEx o kahit ang mga non-onliner ENZOpporters na laging sumusuporta kay Enzo ay dumami. Sinasabing isa rin si Enzo sa may pinakamalaking fanbase sa StarStruck. Dahil dito ay talaga nafa-flatter ako at naappreciate niya lahat ng mga sakripisyo namin para sa fanbase nya. Kasabay ng pagdami ng ENZOpporters ang pagdami ng sub-fanbase names, Nariyan ang ENZOMNIACS, ENZOMANIA, ENZSARAH, ENZOFORCE, ENZOCO at ENZO UNLIMITED. Silang lahat na todo todo ang suporta na binibigay lagi kay Enzo. Hindi nila hinahayaang mapag iwanan si Enzo. Bagkus ay sumasabay pa ang ENZOpporters sa pagsisikap ni Enzo para sa kanyang pangarap, sumasabay na nagsusumikap para tulungan at suportahan ang nag iisang ENZO PINEDA. Maraming isyu na kinaharap. Maraming bahsers ang kinalaban ng ENZOpporters, maging si Enzo. At hindi pa nakuntento ang iba ay idinawit ang magandang pangalan at reputasyon ng mga magulang ni Enzo. Hindi kailanman naging kasalanan ang ipanganak kang mayaman. Hindi kailanman binuksan ang isang reality television seach para sa mga kapus palad. Ito ay bukas para sa lahat. Lahat na nagnanais matamo ang lahat ng kanilang pangarap sa buhay. Lahat ng mga balakid na ito ay sama samang hinarap ni Enzo kasama ang kanyang mga taga hanga ng buong tapang at buong lakas. Hindi sya nagpaapekto sa mga masamang bwelta ng iba, kahit na ilan sa mga co-survivor nya na nagsalita laban sa kanya. Nagpakababang loob na lamang si Enzo para mapanatili ang magandang samahan niya sa kapwa nya survivors. Ipinakita nya ang kanyang lubos na pagsusumikap na mapatunay sa lahat na karapat dapat syang makatanggap ng isang nag uumapaw na suporta mula sa lahat ng taong labis na humahanga, sumusuporta, umiidolo at nagmamahal sa kanya. Ang tapang at tatag sa gitna ng mga kontrobersiya na ibinabato sa kanya ay ang mga bagay na dapat na gayahin ng isang kabataan. Isang mabuting ehemplo para sa mga taong nais maliwanagan sa buhay si Enzo Pineda. Pamilya ng mga mabubuti ang Pineda Family. Itinuring nilang Kapamilya, Kapuso, Kabarkada ang lahat ng ENZOpporters. Sila na laging pinupunterya ng mga bashers. At katulad ni Enzo, hindi sila nagpapaapekto at nananatiling matatag para sa kanilang anak at para sa ENZOpporters. Ang mga magulang ni Enzo Pineda, Tito Eric at Tita Macy, mga nagsilbing mga magulang naming ENZOpporters. Sila ang nagturo sa amin tungkol sa tunay na kulay ng buhay at lahat ng mga mahahalagang bagay na ibinabahagi sa amin ng lahat ng tao na nasa paligid namin. Nakita ko sa kanila ang kanilang pagsusumikap na tulungan ang kanilang anak sa gitna ng pinagdaraanan nitong pagsubok sa larangang pinasok nito. Suportado sila sa pangarap ng kanilang anak. Kaya naman bakas sa pagkato ng isang Enzo Pineda ang isang taong likas na mabuti, may pinag aralan at isang taong napalaki ng tama. YEARS HAVE PAST SINCE THIS THREAD HAVE STARTED...MANY CHANGES AND ADDITION OCCURS...NEW FACES, NEW TRIALS, AND NEW EXPERIENCES HAS ARISED.. PARTICIPATE IN SOME FANBASE PROJECTS. Core Team and Staffs of this fanbase will be presenting such projects for Enzo and for the whole fanbase. Please do participate in every projects. Be an active ENZOpporter not only by posting, but in participating with the fanbase projects and tasks. SPAMMING IS NOT ALLOWED HERE. posting of less than 2 words will be considered as spamming. If possible (though we know that it is really possible), make your posts full of sense enough for this thread. Even the repeating of posts are not allowed here. Except if the post is important and need to repost again. AVOID MULTI-QUOTING. this would cause internet connection breakdown. It would make the thread page load harder. AVOID REPOSTING OF POSTS. You can repost anything UNLESS it's necessary to be reposted. This can cause a hard time for others to read back the pages of this thread. IRRELEVANT TOPICS ARE NOT TOLERATED HERE. The subject of this thread revolves around Enzo Pineda and everything about him. Avoid posting of posts with irrelevant thoughts about Enzo Pineda and about ENZOpporters. We should learn to give respect to the person to where we dedicate this thread. ALWAYS GIVE CREDITS FOR EVERY WRITTEN OR PRINTED MATERIALS YOU POST. Put credits in the end of your post for every written articles or pictures that you post. Especially if you find it somewhere in the net, do put credit on the site or to the person to where you get that material. KEEP EVERY INFORMATIONS ABOUT EACH AND EVERY MEMBERS HERE PRIVATE. We do not have to publicize such informations about our fellow ENZOpporter. For their privacy and protection, just keep every informations about them private. Even some informations about Enzo would have to be private. We do not have the rights to publicize any informations about other people unless we are told and free to do so. STILL WE OUR FREEWILL TO DO WHAT WE WANT BUT ALSO ALL OF IT HAD LIMITATIONS. sa wakas 18 thread narin.. hahaha !